Copyright � 2008 American Geophysical Union. The Early Cretaceous Ontong Java Plateau (OJP) in the western equatorial Pacific, Earth's most voluminous large igneous province (LIP), is characterized by intrabasement seismic reflections. To investigate the nature of such reflections, we have analyzed new and all older multichannel seismic (MCS) reflection data from the OJP using an instantaneous phase velocity analysis technique and synthetic seismograms. Intrabasement reflections are most prevalent on the main OJP, especially on its crest. On MCS data, the reflections (1) are semicontinuous and subparallel to the top of igneous basement; (2) in places, have the opposite phase of seafloor reflections; and (3) have an average frequency of ∼20 Hz. We calculate synthetic seismograms using impedance contrasts between massive lava and pillow lava flows obtained from downhole logs at OJP scientific drill sites and show that these lithologies can produce intrabasement reflections similar to those observed in the MCS data. Alternatively, to evaluate the possibility of sediment/sedimentary rock interbeds causing the intrabasement reflections, we use published Early Cretaceous sedimentation rates determined from OJP drill sites and published estimates for the duration of massive OJP volcanism to calculate a range of possible sedimentary interbed thicknesses. The range proves to be below the detection limit of the MCS data. 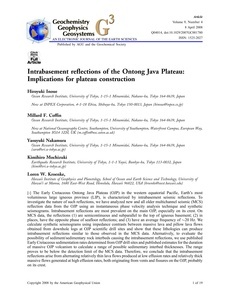 Therefore, we conclude that the intrabasement reflections arise from alternating relatively thin lava flows produced at low effusion rates and relatively thick massive flows generated at high effusion rates, both originating from vents and fissures on the OJP, probably on its crest. Copyright 2008 by the American Geophysical Union.